DS Cigars | All your cigar needs in one place. If you live or are near New York City, you know that the tobacco tax is ridiculously high. Taxing tobacco won’t stop anyone from buying it, all it does is put good cigar shops out of business because you can’t buy as much as you want because prices are too high because of the tax. One good thing to come out of it is that cigar companies started making cigars for the New York market. They created great, hand-made cigars at a relatively low price so that even once the New York tobacco tax is added, it is a nice price point that doesn’t break the bank. Alec Bradley is one of those cigar companies. They created the New York line, and I smoke the Empire Toro, which is 6 x 54. It has a beautiful dark wrapper with an almost reddish tint to it. This was a good looking cigar and I was looking forward to cutting and lighting it. The cigar is balanced nicely, with a good draw to it as well. I picked up flavors of wood, chocolate and some leather as well as a nice cedar to it. This is a great cigar with a good price point for NYC. When you are in New York, make sure to try one out. If you have, let me know what you think in the comments below. If you don’t know the story about Paul Garmirian, you can read it here. It’s pretty interesting, and if you had time to read his book, you should. It’s an easy read, and was pretty relevant when first published. If you are looking for a great, mild, flavorful cigar, you need to try P.G. Cigars. 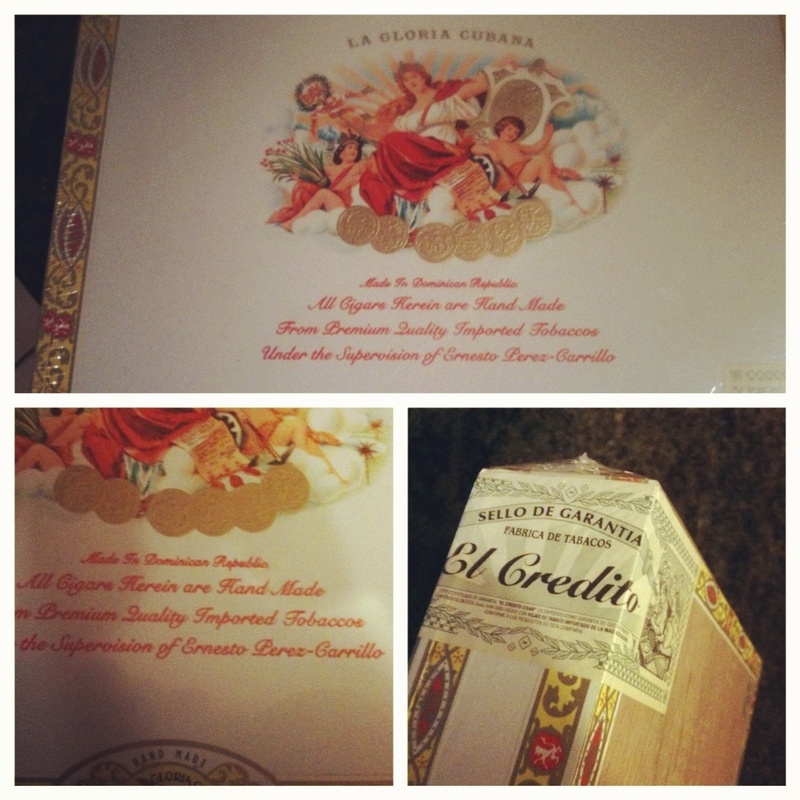 They are extremely well-made, and overall just a good cigar. The wrapper is oily, and it has a full and easy draw. The cigar is nutty and toasty, with a nice mild finish. If you are looking for a high-end flavorful cigar, then try P.G. Cigars. Look what I found in the back of my humidor, a box of La Gloria Cubana Churchills from when Ernesto Perez-Carillo was running the factory. I’m so excited to open it up and smoke them, but on the other hand want them to keep aging. But, if you know me, then you know what I’ll be smoking this weekend. Stay tuned for a review at some point. One of my recent favorite shows is Person Of Interest. It’s just a good drama show and always has good twists and turns. Plus, he’s a good guy, done some bad things and is now trying to make amends. In some way, we can all relate to that I’m sure. Today’s cigar review is the Rocky Patel Olde World Reserve Maduro Toro (6 1/2 x 52). It’s a dark cigar, with a very boxed pressed shape. It’s dark and oily, with a nice draw. It has notes of wood, cedar and a hint of licorice. It has a nice, short finish. Overall, a good cigar, Rocky Patel usually delivers, and this is another one. Try one today, and let me know what you think below. Today’s review comes from one of my favorite cigar brands. Now don’t get me wrong, I love all the brands, but when I started smoking C.A.O.’s, I couldn’t stop. I tried all different lines as they have come out, and have loved most of them. Sure, there are some lines I like more than others, but with cigars, it’s all personal preference. Tonight’s review is the C.A.O. America Landmark (6 x 60). Some call it a candy cane wrapper, I usually use the term barber pole. For me, I enjoy it because it’s unusual to look at and others around start talking about it, which makes it more fun. I always enjoy a good conversation with a cigar. This cigar has a excellent draw, with a nice even burn. It’s a medium-bodied creamy cigar with some notes of cedar as well. Overall, a pleasant smoke, with a great draw and great flavor. Try one today, especially if you haven’t had a barber pole wrapper before. Let me know what you think below. Filler: Nicaragua, Italy, Dominican Republic, U.S.A.